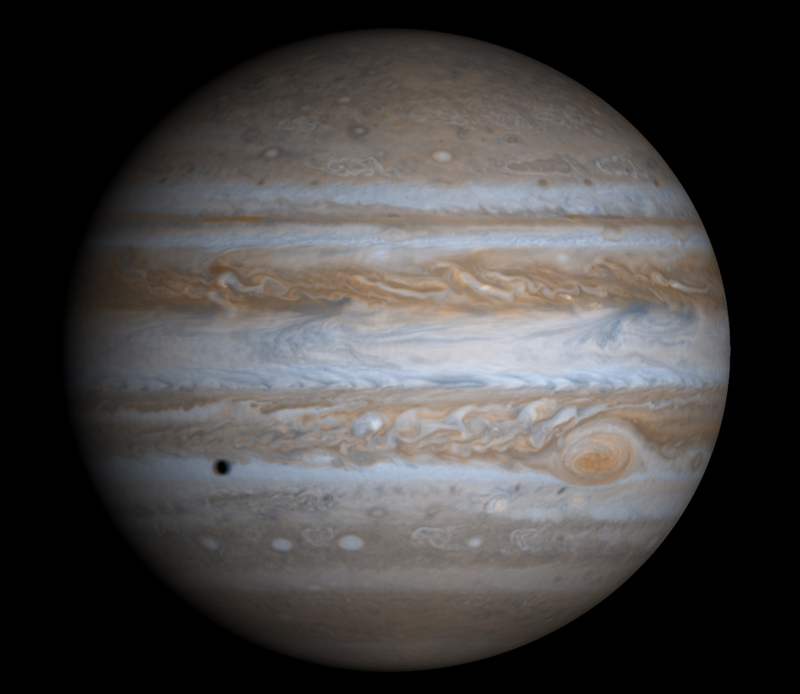 Jupiter is the closest gas giant planet to the Sun. It is also the largest planet in the solar system, with a mean diameter of 142,984 km, large enough to contain more than 1,300 Earths. Jupiter’s atmosphere is chiefly hydrogen (86%) and helium (13%). The planet has no solid surface and is constantly shrouded in bands of cloud with super-hurricane-force winds. Jupiter’s famous Great Red Spot is an anticyclonic storm that has been raging for more than 300 years. Jupiter probably has a solid core at its centre whose temperature could exceed 20,000°C. This core is surrounded by a layer subjected to heating and pressure effects. Liquid atomic hydrogen is present in metallic form and vortices and eddies generate a huge magnetic field. 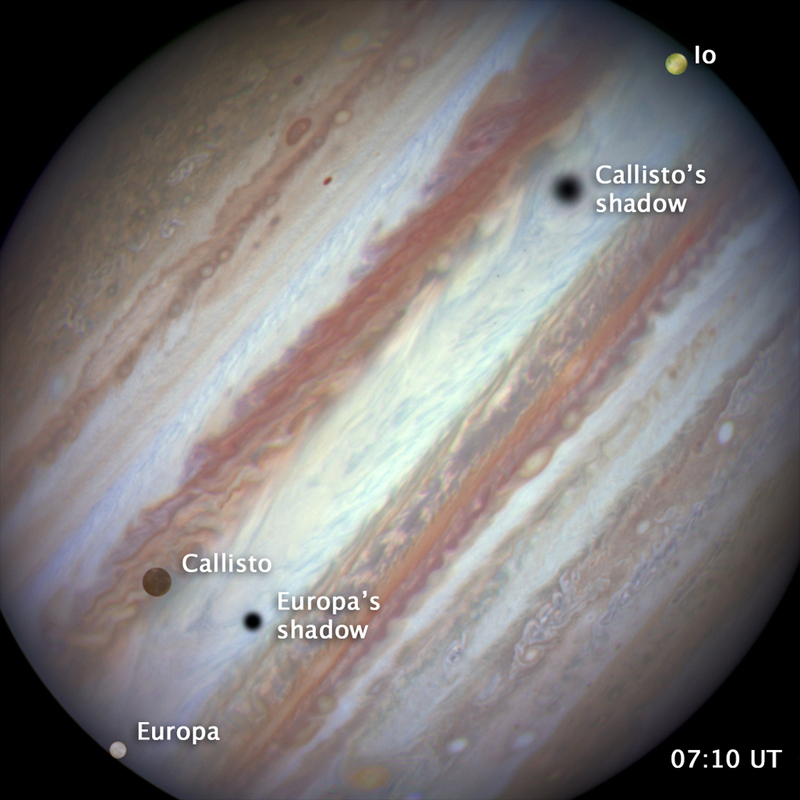 A layer of liquid atomic hydrogen lies beneath Jupiter’s cloud layer. Here, the increasing pressure means that the hydrogen is in a liquid rather than a gaseous form. The atmosphere, composed largely of hydrogen (H2) and some helium (He), extends upwards for nearly 5,000 km into interplanetary space. Thick clouds form alternating bands of different colours. Very violent winds blow at speeds often reaching 360 km/h. Jupiter also has a system of thin and diffuse dust rings that are difficult to detect. Jupiter’s gravitational attraction is strong enough to pull a large number of moons into its orbit. There are currently 67 known moons, but the system is dominated by four planet-sized moons. These four huge moons, known as the Galilean satellites, are Io, which is volcanically active; Europa, which has an icy surface; Ganymede, which shows traces of past geological activity; and Callisto, whose surface is pocked with craters. The latter three moons also have liquid oceans beneath their icy crust. Ganymede is the largest moon in the solar system, spanning 5,262 km. The JUICE satellite (JUpiter ICy moons Explorer) is set to depart in 2022 to study Jupiter and three of its moons (Ganymede, Europa and Callisto). Data from this mission will help scientists to determine whether conditions for life might exist in the liquid oceans under the moons’ crusts. One of the satellite’s instruments, MAJIS (Moons And Jupiter Imaging Spectrometer), is being built by the IAS space astrophysics institute with technical support and funding from CNES. The agency is also funding contributions to five other instruments on which French research laboratories are working.